Google revealed that its Assistant Routines would be integrated into the Clock app just a couple of days ago, giving you information like the day's weather, your upcoming calendar, and other configurable settings after the alarm is dismissed. At the time, we were told the feature would be rolling out this week, and Google seems to have just barely made that cutoff. Google Assistant Routine integration into the Clock app is now live. It's simple to set a routine, too. 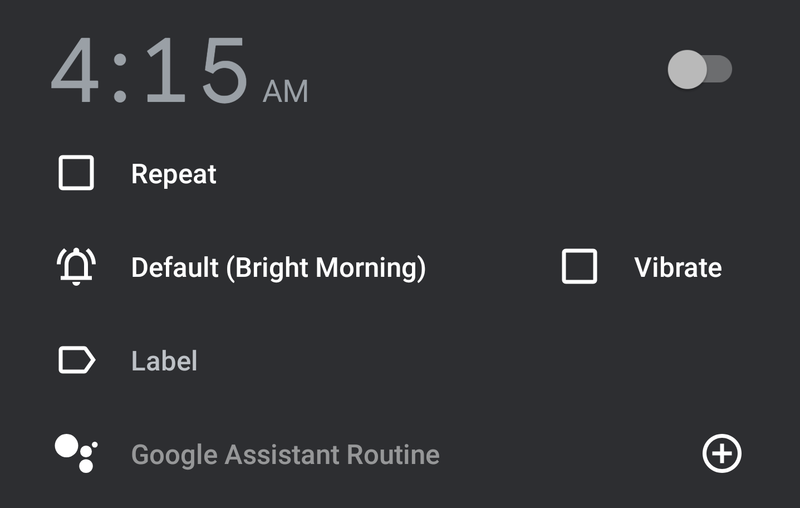 Just create an alarm, go to the new "Google Assistant Routine" section that should appear in the alarm, and follow the prompts to set up your Routine. When the associated alarm goes off and is then dismissed, the commands configured will be triggered. We've tested it out ourselves, and it all works as you'd expect. Left: The new Routine setting in the Clock app. Center and Right: Workflow when setting a Routine via the app. Keep in mind, this only works for Google's clock app. The functionality is not present in other OEM-specific versions of the Clock app, like the one provided by OnePlus (even if it looks similar). Thankfully, the Clock app isn't one of those that Google keeps restricted to specific devices. In my own testing, the Assistant Routine integration in the app works on any phone — though if you didn't already have it installed, you might need to reboot to see the option appear, and you may run into some issues with alarms and Doze using Google's Clock app on devices it wasn't preinstalled with.